A friend of mine and I were discussing Tangled recently, and when I asked him why he hadn’t liked the movie, he replied, “It was just too dark to be a kids’ movie.” It took me a while to understand what he meant by that—surely a movie about a princess and her animal companion friends wasn’t dark? Then I realized that while the characters themselves may not have been particularly bleak, the theme of the story was. The driving force behind Tangled is the twisted relationship between Rapunzel and Mother Gothel, and understanding it is key to understanding why Tangled was such a great movie. For those of you who haven’t seen the movie yet, Tangled is the story of a girl, Rapunzel, the daughter and only heir of the king and queen of a fictional country. While pregnant with Rapunzel, the queen got very sick, and so the king dispatched troops to look for a magical golden flower, which, according to myth, had grown from a “single drop of sunlight that fell from the heavens”. They found it, made it into a tea for the queen to drink, and she miraculously got better. When Rapunzel was born, she had lovely golden locks the same color as the flower. However, Mother Gothel, the villain of this story, had been using the flower at intermittent times to restore both her youth and her beauty, and she was furious at the disappearance of the flower. She tracked down Rapunzel and discovered that the flower’s magical healing properties had been transferred to Rapunzel’s hair. When she attempted to cut a lock of hair to keep for herself, the lock turned brown and lost its power. Enraged, she stole Rapunzel from the palace and shut her up in a tower so that no one else could ever use (or cut) Rapunzel’s hair. What is also fascinating about this film is that the villainess (Gothel) masks her villainy in the guise of love. She does not have the wealth of Cruella De Ville, nor the magic of Sleeping Beauty’s Maleficent. She is only equipped with an arsenal of emotional manipulation and self-esteem grenades, designed to keep Rapunzel afraid of the world and herself. As such, she is an amazing archetype for the devouring mother that many women must (to greater or lesser degrees) face in order to get free, and fully come into their own. 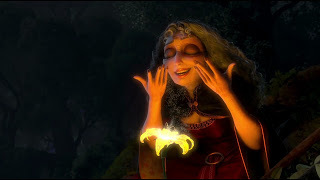 Gothel: How you manage to do that every single day without fail! It looks absolutely exhausting, darling. Gothel: Then I don’t know why it takes so long! Along with these back-handed compliments, Gothel constantly belittles and insults Rapunzel under the guise of motherly “teasing”. “You know what I see?” she tells Rapunzel, as the two of them stand before a mirror. “I see a strong, confident, beautiful young lady. Oh look, you’re here too.” When Rapunzel looks sad and offended, Gothel lightly tells her to stop taking everything so seriously, thus invalidating Rapunzel’s legitimate feelings about Gothel’s words. When Rapunzel asks to see the lights for her birthday, Gothel demands, “You want to go outside?” and launches into the song “Mother Knows Best”, in which she makes Rapunzel feel guilty about her desires, dramatizes the horrors of the outside world, and says that Rapunzel is too immature, clumsy, and ditzy to venture out into the world. 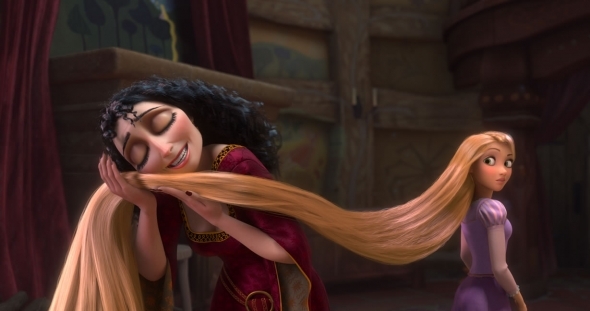 Gothel calls her “pet” and “flower”, tells Rapunzel she’ll keep her safe and sound while simultaneously rubbing her face in Rapunzel’s hair, and, in short, views Rapunzel as more of a possession than a human being. Even though Rapunzel has a vibrant, energetic personality, years of continued abuse have clearly taken their toll on her. When she leaves the tower with Flynn Rider, she simultaneously can’t believe that she’s finally outside, and she can’t believe that she’s been such a horrible daughter as to betray her mother’s most stringent wish. When Flynn expresses begrudging admiration of Rapunzel’s charming the criminals of the Snuggly Duckling, Rapunzel’s first reaction is to say “I KNOW!” in an incredulous voice, as if she can hardly believe herself capable of such a thing. Most tellingly, when Rapunzel is telling Flynn why she must stay in the tower, she shows Flynn her one lock of brown hair as evidence of the danger the outside world poses to her and says, “That’s why Mother never let me…” and pauses. “That’s why I never left,” she concludes. She’s internalized Gothel’s abuse to such an extent (and Gothel has so isolated Rapunzel from any other points of view) that Rapunzel fully believes it was her own choice, and the right choice, to never leave the tower. In her eyes, Gothel hadn’t even done anything wrong—she had just been protecting Rapunzel. Ignored in all versions [of the Rapunzel story] is this question: If Rapunzel can secure her tresses to a hook to allow the witch to climb up and down, why can’t she hook the end of her coiffure and climb down it? Understanding the mindset of a survivor of emotional abuse is key to understanding Rapunzel’s very real agency in Tangled. Mother Gothel is the scariest villain in Disney’s arsenal, bar none, because she is so frighteningly real that people who haven’t experienced or studied abuse might not realize the extent of what she’s doing. It’s through Gothel that Disney portrays a theme not often approached in Disney movies: emotional abuse. And their portrayal of it was so subtle that a lot of viewers never realized what they were seeing. Rapunzel: I’m the lost princess. Gothel [sighs]: Please speak up, Rapunzel, you know how I hate the mumbling. Rapunzel [louder]: I am the lost princess. Aren’t I? [Gothel looks stunned] Did I mumble, mother? Or should I even call you that? Gothel: Oh, Rapunzel, do you even hear yourself? Why would you ask such a ridiculous question? Rapunzel: It was you! It was all you! Gothel: Everything I did was to protect you. [Rapunzel pushes her] Rapunzel! Rapunzel: —when I should have been hiding… from you! Rapunzel: You were wrong about the world. And you were wrong about me. And I will never let you use my hair again! Every one of these actions is very difficult, especially for a person as victimized and as brainwashed as Rapunzel. A person who has never faced these challenges might well watch the movie and think, “Finally, she’s growing a spine!” but in truth, it is very difficult to do what Rapunzel does in the movie. Facing off with Mother Gothel was her crowning moment of agency. Mental strength is so taken for granted in our society that people might not see this realization, this standing up for herself, as agency. But it is. If there was one facet of emotional abuse that Disney didn’t cover, it would be Rapunzel’s recovery from the toxic environment in which she had lived for eighteen years, but as that really might have been too dark for a Disney movie, I think it’s fine that Tangled doesn’t go into it. As it is, Rapunzel does reach out to Gothel as Gothel is falling from the tower, and while that may have been Disney’s attempt at showing Rapunzel as the innocent, morally good character that they demand of all their protagonists, when viewed through the lens of Stockholm syndrome and emotional abuse, Rapunzel’s actions can easily be read as one more attempt by the victim to save the abuser despite all that Gothel had done to her. Perhaps having this theme in a children’s movie was a little dark, but Tangled teaches a valuable lesson that isn’t typically seen in children’s media, and it does so in a subtle, nuanced way that makes it easy, or as easy as this sort of thing can possibly get, for parents to have a conversation with their children about this sensitive topic. Other Disney movies cover themes such as the importance of hard work and the importance of being yourself. 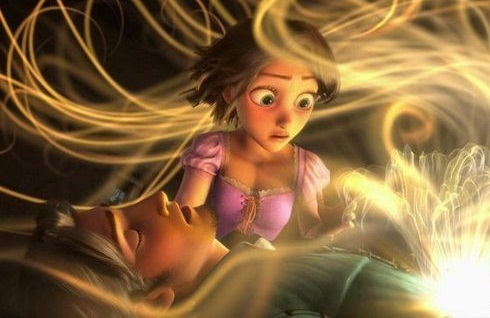 For some children, Tangled‘s theme might be equally as important. This entry was posted in Disney, feminism, movies, opinion and tagged emotional abuse, flynn rider, In Brightest Day, rapunzel, tangled by porluciernagas. Bookmark the permalink. i’ve been analyzing this movie– all the themes, all the symbols, but this, i’ve never even noticed. 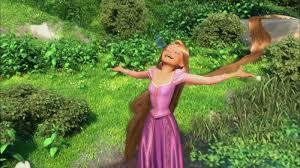 It shows that even though Rapunzel was born because of the magic flower, she is not JUST the flower. She is like the Sun, which also encompasses the flower. 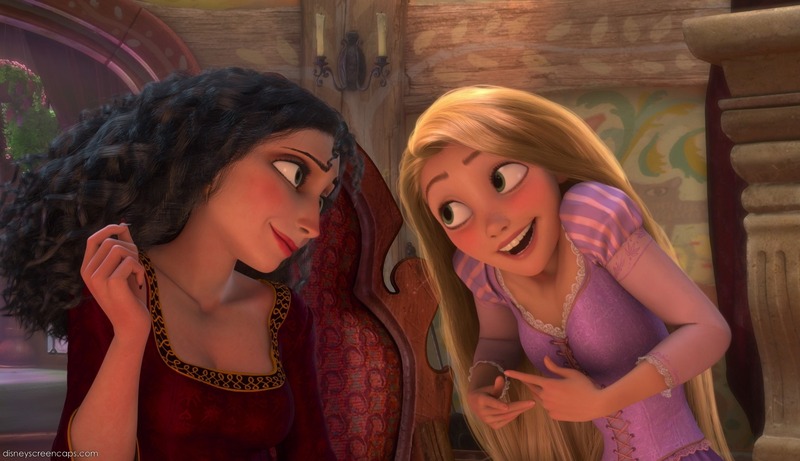 Gothel has only been treating her like the flower, like a tool, when she is so much more than that. And, i guess, this is the final piece i’ve been looking for. What sums up all my analysis of the movie. Disney has made my childhood, and this movie is definitely Disney quality, but never a movie that has so much depth and so much to soak up than this. It is worth watching over and over again, and you can still find something that you’ve probably never noticed the first time around. This is amazing. Each time I watch Tangled with my little ones it really hits home the subtlety of emotional abuse and how trapped an blinded it can make you. The scenes just after she leaves and is up and down “I can’t believe I did it!” Excited, elated ” I can’t believe I did it” as in what have I done. Panic. Regret. Fear of not being told what to think anymore. The only thing I dislike is that she DOES have her knight in shining armour come and rescue her really when she meets Flynn but maybe you do need to meet someone to help you find your way out of this kind of situation. Not everyone has a Flynn Rider to aid their escape. Sadly I fear I am trapped in my tower in an emotionally abusive relationship and I wish I was as brave as Rapunzel and run away. Don’t stay trapped in your abusive relationship. Run away; if you can’t do it for yourself, do it for your little ones. I stayed for over 2 decades before I was finally able to say “Enough!” So much damage was done in those years. My sons are all grown, and were teenagers when they first saw Tangled, and one of them said of Mother Gothel, “It’s Dad!” All four of my sons are extremely messed up in many different ways because I stayed when I should have run. Please, please rescue your children from their abuser. Rescue yourself! As someone who grew up with an emotionally abusive mother, and who loved this film, I really appreciate this analysis. 😉 I never thought about the story of this movie in these terms, but you’re right, and it’s powerful and actually quite well done. It was a really good movie, one of my favorites. I loved Flynn’s progression and actually? Gothel’s character. Like you said, she’s so real. But the first time I watched it, I got scared. Like, “oh lol my daughter’s left. TIME TO GRAB THE KNIFE TEE HEE”. Is it wrong of me to say that I wish we could have seen Gothel’s bones shatter at the bottom of the tower? I consider her the most evil of the Disney villains. I have seen the movie many times, and I saw Gothels ways of abusing Rapunzel. As a kid, I remember I did not like her mother. And as I was reading this, I cried. I cried when I read about the scene where Rapunzel confronts her mother. It is something that is very brave of her to do, because that is not easy. She had to realize her hole life has been a lie, and that the mother she thought loved her and protected her – was using her for her hair. 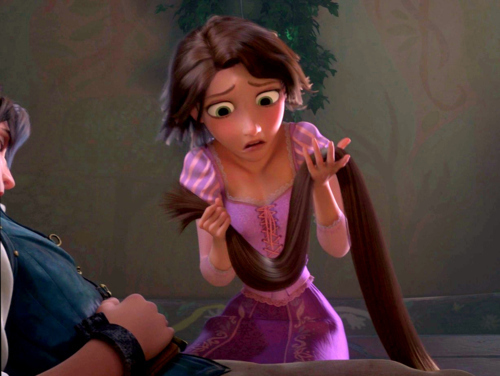 And then I came to think about that Flynn cut her hair off in order to save Rapunzels life. And then I started crying even more. He was not there to use her for her hair, he actually loved her. He was cut off her hair, which has healing powers that he could use, but he did not. Flynn loves her, and he does the opposite of what her mom did. He cuts off her hair.